It's hot out. Like, 100 degrees and humid hot out. Now this may be reminiscent of my early waitressing days at Cafe Noche, but hot weather always makes me crave tequila. When I first saw Espolon at the liquor store I was immediately drawn to the absolutely beautiful labels inspired by 19th century style Dia de los Muertos Catrina figurines. 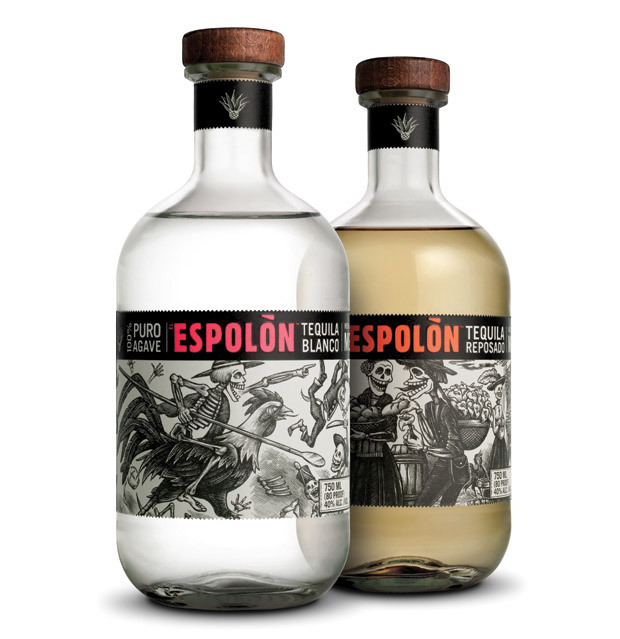 The labels hold a lot more than beautiful craftsmanship however, they both tell a fictitious history of Mexican revolution and independence from Spain, honoring the brave men and women who are responsible for Mexico today. The Blanco label depicts Ramon the Rooster and the rebels fighting against tyranny and the caste system imposed by Spain, setting the stage for Mexico's independence. The Reposado label illustrates elements of the ancient Aztec culture infused into the market places of Mexico, to keep the spirit of their ancestors alive. Not only are the bottles beautiful, the tequila is really, really good! It's margarita time, cheers!